The Bicycle Coalition and Complete the Trail campaign teamed up with Pennsylvania Environmental Council to helpe the City of Philadelphia and 5 other counties put together the application that led to this award. Read our joint press release. The sponsors involved in the funded segments include Department of Parks and Recreation, Streets Department, Schuylkill River Development Corporation, Delaware River City Corporation, Bartram's Garden and PEC. Although projects in Delaware, Montgomery, Schuylkill and Bucks Counties did not get included in this award, we will continue to work with our regional partners to help secure funding for these projects so that both the Schuylkill River Trail and East Coast Greenway can be completed. 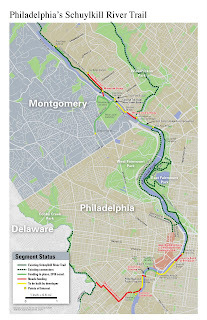 The campaign to Complete the Trail will continue to help find funding for the 5 remaining SRT gaps in Philadelphia including the Wissahickon Gateway, Manayunk Bridge, Ivy Ridge Trail, Gray's Ferry Crossing and West Bank SRT Connector. way to go guys. those projects have been hanging around for years, glad to see them on track. gihon is smiling. THANK YOU for all your hard work and determination.